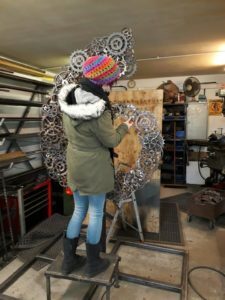 Erasmus Darwin House will be unveiling a new sculpture in it’s Herb Garden by local artist, Hannah Golding, based on the theme Darwin’s Lunar Legacy. The unveiling with take place on 13th April and there will also be a month-long exhibition which explores Hannah’s development of the piece and all the art work created by the local community. Hannah has worked with local groups such as Charnwood Children’s Centre, Together the Mental Health charity and the art students from South Staffordshire College, Lichfield Campus, all of whom have made art work which will be on display in their new exhibition room. This project first started back in March 2018 when Erasmus Darwin House was awarded a grant for £25,050 to produce the sculpture and exhibition, from Swinfen Broun Trust, facilitated through Lichfield District Council. The funders thought that Erasmus Darwin House’s commitment to engage with the local community to produce art work alongside Hannah was exciting and they are looking forward to seeing the outcomes on the 13th April. Not only did the project encourage the local community to get ‘hands on’ with various mediums, it also enabled the museum to provide valuable work experience for students from the University of Birmingham who are helping to write the information panels about the project and develop family activities to accompany it. Ruth Buttery, Grants and Projects Officer at Erasmus Darwin House, who has worked closely on the project states “seeing Hannah Golding and the local community groups working together to create their art work for the exhibition has revealed that the theme is still relevant to today’s society – working together to collaborate and design something new creates a unity within these groups and a sense that together they can achieve new things and feel like they can go on to develop more ideas for the future, which without participating in this project they would not have discovered”. Erasmus Darwin House have the unveiling of the statue on 13th April and everyone is welcome to attend our free family craft activities on the day which will run from 12.30pm-2pm and visit the exhibition which will be open from 11am-5pm. The exhibition will then be open everyday 11am-5pm until 12th May.